Russia is planning to deliver trucks, boats and other equipment to West African countries and train African students at its own expense. In exchange, Russian companies will be allowed to catch more fish in the Atlantic, where the presence of their fishing fleets have been waning. The Russian fisheries agency Rosrybolovstvo has presented a report “On Measures to Ensure the Presence of the Russian Fishing Fleet in the Zones of Foreign States” to the government commission on agriculture and fisheries. The report notes the falling Russian catches in exclusive economic zones within 200 miles of the coast. Fishing in coastal waters is highly profitable and effective. However, competition is becoming stiffer by the year — and nowhere more so than in West African countries. Russia has been fishing in the region since the 1970s. In the mid-1980s, it caught between 1 and 1.5 million tons of fish off the coast of West Africa, especially in Morocco, Mauritania, Angola and Guinea-Bissau. However, the early 21st century saw the appearance of trawlers from the EU and China, while Russian catches dropped from 211,000 tons in 2011 to 148,000 tons in the first nine months of 2012. “Today, the Murmansk trawler fleet and vessels from Kaliningard are operating there. But the African countries are imposing ever tougher terms for the issue of fishing quotas, raising prices and limiting fishing areas,” Vladimir Grigoryev, chairman of the Northern Fishermen’s Union, said. 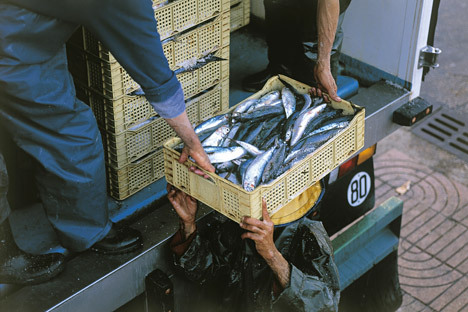 The main fish caught in West African waters are sardines, horse mackerel, sardinella and mackerel. The Russian fleet is mainly active in the zones of Morocco, Mauritania, Senegal and Namibia. Rosrybolovstvo press spokesperson, Aleksandr Savelyev, believes cooperation with West Africa is strategically important if Russia is not to lose its traditional fishing areas. It is not so much about fish as it is about the presence of the Russian flag in the region. Fishermen’s interests are more down-to-earth. According to the Association of Russian Fishermen, which fishes off the West African coast, it would be ideal to double the Russian fishing quota to 400,000 tons. Today, fishermen sell one ton of fish for about $800, so, this increase would mean an additional $160 million. Rosrybolovstvo proposes that the Russian fleet’s presence in the region be preserved and expanded by helping African states solve some of their problems. Among other things, it is discussing with the government the option of delivering Russian 4x4 trucks and office equipment to Africa, building three patrol boats for Senegal and Guinea-Bissau, and providing additional places for West African students in Russian universities. All of this would be financed out of the Russian budget. Rosrybolovstvo proposes to increase the current quota of university places for foreign students and postgraduates specializing in fisheries at various universities in Vladivostok, Murmansk, Astrakhan and Kaliningard from 60 to 75.